This past week all of YouTube went down. The site was only down for about an hour but, by the sounds of the news the next morning, some people called the cops over the outage. While I don’t think any of you think 911 is the correct place to check to see if a website is down, if you have general internet connectivity but just can’t seem to get to a specific site, there are a number of ways you can check to see if the site is having issues. Larger sites may have a status webpage and some use Twitter, Facebook or another social media site to post site issues. A number of larger sites will use all of the above to report if there are issues. One method of checking on a site is to try searching for the name of the site/service and “status” to see if it will bring up a status web page or point you to their social media account(s). There are also a number of websites where you can check that status of a specific webpage. I’m mentioning more than one since, during the YouTube outage, at least one of the sites used to check to see if a site is down had issues due to the sheer volume of people checking to see if YouTube was down. Down for everyone or just me: https://downforeveryoneorjustme.com/ Enter in the URL for a website and it will tell you if the site is down, up or might be experiencing troubles. Is it Down Right Now: https://www.isitdownrightnow.com/ This site has the same “check” ability but also lists the current status of a number of major sites. Downdetector.com https://downdetector.com/ There are buttons on the page for many, many web pages. On each of the buttons is a graph showing the recent problem history and, if you click on the button, you’ll go to a specific page for that site with more information. Instead of entering in the URL, use the company name in the search box to see if that site status is being tracked. Several other members of the SCLS Technology Team and I ventured to Austin, TX for the annual SpiceWorld Tech conference this week. Something that I found rather notable was not at the conference itself but was whirring all around the city. They were these bright green-colored electric scooters associated with a company called Lime. 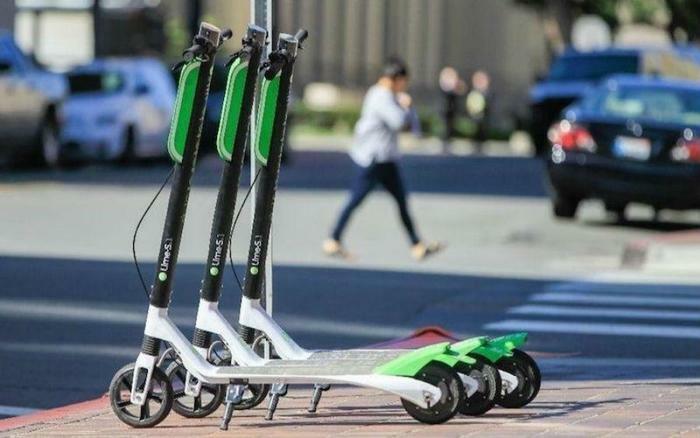 Lime sets out to offer communal modes of transportation through the form of scooters, bikes, and transit vehicles to provide people with available access to short distance travel. On the Lime website (www.li.me), it appears that some of the purposes of this initiative is to reduce dependence on personal automobiles and, thus, reducing the negative effects of emissions and general traffic. What we saw was a large number of these scooters sporadically parked all around the city. It would seem that a person could jump on when they found one (for a fee) and then ride to their destination and then park the scooter there. There were definitely a lot of these scooters around and we saw many, many people riding them. After referencing the Lime website here is how it works. You must first download the app to your mobile device. You then can see on a live map the locations of various Lime vehicles. Once you have found the Lime you wish to ride, you will scan the QR code on the vehicle to unlock (in Austin it was $1 to unlock the scooter). You then ride to your destination (in Austin this was 15c per minute). When you are done you just park and lock the vehicle. Now you might be asking how these e-vehicles stay charged. It looks like it is entirely made up of with volunteers that collect the vehicles and charge them independently. They do get paid to do this of course. It was very interesting to see these Lime scooters on the streets and it seemed to be quite a popular way to get around the city, especially among the 18 to 30 age range. I had never seen anything like this at least in the sense of the vehicles being parked literally anywhere and everywhere. As far as Wisconsin is concerned I was surprised to see that Green Bay is one the locations with Lime transportation. I am not too sure how these scooters or e-bikes would fair in the winter but if you are ever in the area, check it out! If you work in a LINKcat library you are probably very familiar with the U.S. Census Bureau American FactFinder tool. We use the Geographies/Address option to identify the "legal place of residence" for our patron records; from city, town, village, census tract and municipal wards. This information is critical for the annual reports we provide the State of Wisconsin and also helps our communities provide accurate information about the density of their patron population and geographic use locations for their community reports. But the U.S. Census Bureau has so much more. One of my sidetracks is also located in the Geography area - Maps & Data. You can map all kinds of data from this point using a variety of data points to produce a multiplicity of results. Learning how to use this will take some time but if you are a map nerd like me you can get very very lost. But there are maps! Google's new service, released in September, allows for a simple search across millions of datasets from publishers, government sites, academic repositories, news organizations, and other data sources. I did a quick search for Wisconsin Water Quality and was fascinated by the variety of datasets available. Give it a try - it's free! A new Outlook Web experience is coming your way sometime soon! Microsoft has worked hard to improve the Office 365 experience. The next iteration of this effort comes as a re-design of the Outlook web user interface. In September Microsoft began offering the new interface to early adopters. Here at SCLS your Technology Team is used to trying out things that aren't quite finished so some of us jumped in. I've been using the new interface for a few weeks now and I have to say I like it. The search is noticeably better, I love the suggested reply's, and the calendar has been improved as well. Microsoft is doing their best to make the mobile and web experience as similar as possible. For more info about the new look click here! When Microsoft finishes their testing, we will move accounts to the new look. There isn't a timeline on this but I assume it will happen this winter. PS There are new sounds available when you get an email....how exciting!